For years, this favored style of architects and CEOs has reigned supreme. Could that finally be changing? Some 80 percent of offices these days are “open,” roughly defined as work spaces that minimize doors in favor of low (or no) partitions, shared desks, and a full-on view of any number of people at once, very often the boss included. 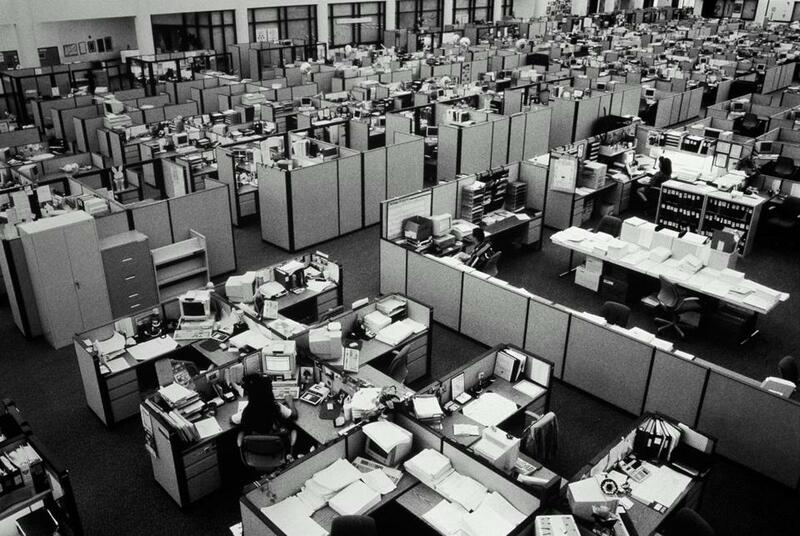 Some 80 percent of offices these days are “open,” roughly defined as work spaces that minimize doors in favor of low (or no) partitions, shared desks, and a full-on view of any number of people at once, very often the boss included. There are two reasons for the format’s popularity. The first is the cost of real estate, says Jeffrey Tompkins, a partner at Boston architecture and interior design firm Spagnolo Gisness & Associates. Twenty-five years ago, he says, the standard allotment was 250 square feet per worker. Now it’s 160 to 190. Simple math says you can fit in more employees when you don’t need to work around walls. The bigger driving factor, however, has been the pervasive idea that open offices encourage collaboration, spark creative conversation, and increase productivity. Since there’s really no such thing as a private conversation in many of these offices, they also serve to symbolize the modern, egalitarian workplace ideal: one big happy family that types together, eats together, and works through personal drama together. “I love the ability to know what’s going on with all the projects around me,” says Faith Marabella, the CEO and president of Wellesley Design Consultants, whose offices transitioned from mostly to fully open a few years back. “I also like the quick interactions that can happen. Everybody can lend a hand when needed and go back to individual tasks when things calm.” The open environment, she says, also lets less experienced staffers listen and learn. Jeff Brayer, who works in an open office in Charlestown as director of sales at OnHand, calls the open office a “procrastination buffet: There’s always someone to catch up with, a game to play, or a comfortable lounge to escape to,” which certainly challenges the idea of encouraging productivity. As Ehlen says: “There’s a lot of back-and-forth switching of gears. You have to be able to make other people’s noise white. People will assume you’re free because you’re sitting there.” One design firm she worked for had a rule, though it was never enforced: Wait until you have more than one question before approaching someone. “Inevitably, people would be having their own meeting and scream over at you, ‘Hey, Cat, what’s the toilet you’re using?’ for this other project you hadn’t thought about for weeks, instead of just noting it as something to ask me later,” she says. 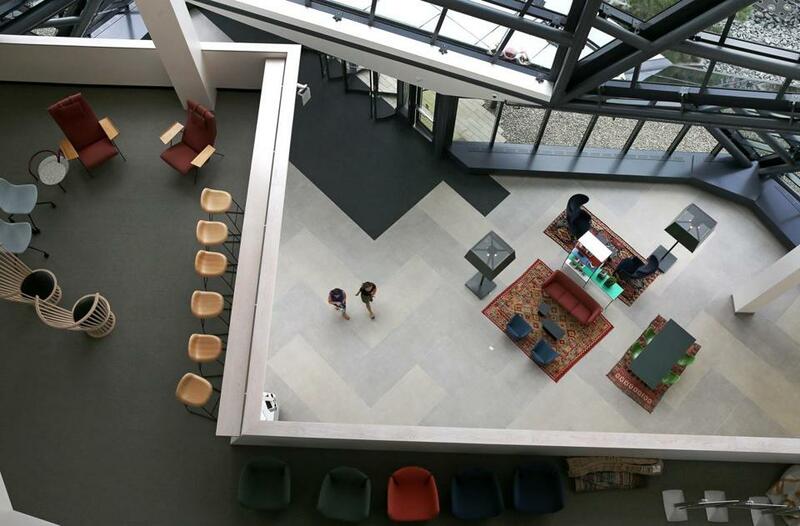 The design of EF Education First’s $125 million headquarters in Cambridge focuses on 10 floors of largely open space. Of course, too much comfort can also be a problem. “In the social media age, there’s already an abundance of oversharing,” says Marabella. “Keeping things professional can be a challenge for some.” (Recalls Ehlen, “I had a co-worker who loved to reheat last night’s fish in the microwave.”) Indeed, the greatest beneficiaries of the open office may be those companies that make products designed to counter it. Cambridge Sound Management, which specializes in sound masking, says its business has nearly tripled since 2011 and that 90 percent of it comes from open office installations. Meanwhile, experts in “change management” — broadly, the structured implementation of organizational change — are chipping in to help with the often tricky transition from closed to open office environments. Although it considers its open office a success, Newburyport branding firm Mechanica is in the process of expanding its space to include what design director Tamara Battis-Lee calls “quiet zones for when people are on deadline or when the open office is distracting.” South End design studio and accessories boutique M. Flynn, meanwhile, co-owned by sisters Megan and Moria Flynn, is in the process of closing up its open offices entirely. “We face each other at our desks,” says Megan. “It makes things feel very casual, and so one of us is always interrupting the other. Or we find ourselves listening in to a salesperson working with a client and then running out to offer our two cents, which makes people feel stepped on.” A few months back, Moria started going to the public library near her home in Milton whenever she needed to focus. “That’s when we really knew,” says Megan, who had meanwhile been taking her most important work calls in the hallway. “It’s kind of sad when you can’t get work done in the office.” The new walls, she says, will be up by spring. Alyssa Giacobbe is a writer in Newburyport and a frequent contributor to the Globe Magazine. Send comments to magazine@globe.com.